This Sunday marks the first stage of the 2018 La Grange Cup! It's your chance to race yourself and your fellow members in a fun environment that is as competitive or casual as you you make it! LG Cup Director Sportif Marco Fantone is back this year again to run the show and make sure that everything goes off without a hitch! You can ride a track bike or a road bike! Or a mountain bike or a cruiser! As long as it doesn't have a motor, you can ride it! You can sign up here but even if you are a complete procrastinator and don't do that, just show up between 12pm-3pm on Sunday and you can race! All participants will receive custom LG Cup socks courtesy of sponsor Seth Davidson Bike Injury Lawyer! As if that's not enough, winners of each stage, category and overall get custom Castelli jerseys - it's FREE and no license or prior experience is required. The first event in the La Grange Cup is this Sunday, the 500M Sprint. If you have not yet signed up there is still time and this is literally the *easiest* of the three events… well, at least it’s the shortest effort and one that anyone can do. Two solo laps around a 250M track and you’re done! What’s that? You don’t have a track bike? NO PROBLEM! 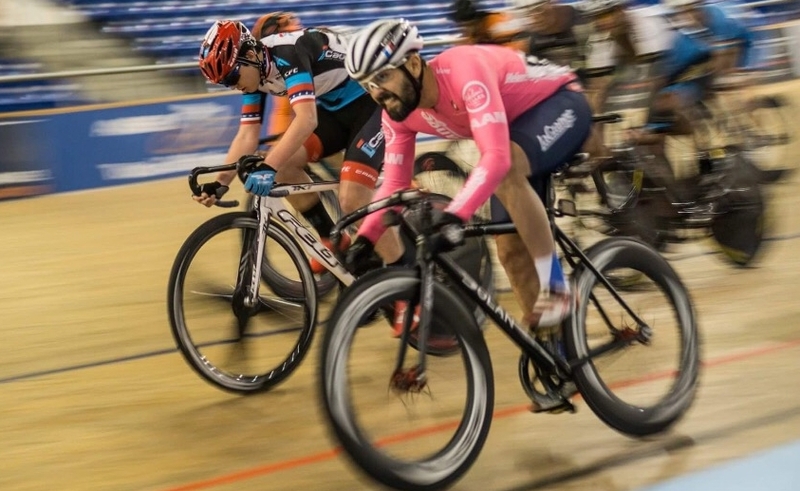 The Encino Velodrome has a very shallow banking and besides, you’ll be riding the entire time on the Black Line (the shortest distance around the track) so it will be on the flat part of the track. Because of this, road bikes ARE allowed on the velodrome for this event ONLY. Talk about members only benefits! So, how does this work? First step, sign up! Here is the link: https://www.lagrange.org/member-calendar#!event/register/2018/6/3/la-grange-cup-1-500m-sprint. Now, just show up on Sunday between noon-3pm (earlier is better) and race your two laps. Some will ride there in the morning, others will bring rollers or a trainer. Encino does have a small “warm up circle” where you can keep your legs loose right before your start, but you’ll need more than that for a proper warm up. This will be a 110% all-out effort, you want to be ready to ATTACK! before you line up. You can also warm up on the bike path that loops around Balboa Park, adjacent to the Encino Velodrome. Before you line up you’ll want to choose your gear wisely. If you are in too big of a gear you will bog down at the start and shed precious seconds… too small of a gear and you won’t hit the speed you need. And while you do have a bunch of gears on your road bike, you don’t need to shift. And if you do shift, once… twice at the most. Changing gears while under maximum load will only cause you to a) ease up for the chain to move or b) mis-shift, both are bad. I’ll be in a 49x14 (95”) on my track bike; on a road bike that’s right between a 53x15 and a 52x15. That *might* be a skosh big if you’ve never done a standing start before. What you’ll want to do is pick a gear that will get you to the back straight, shift once after you sit down (before Turn 3) and at most one more shift when you start your second lap. I would probably recommend starting in a 53x17/18 and shift to a 53x16 (90”) for most riders. OK, you’re all warmed up and in the right gear. Next, you’ll be called up to a staging area right before your start. When it’s your time to go, you’ll roll up to the line where a volunteer will hold you and your bike in place. There will be a countdown: “5, 4, 3, 2, 1, GO!” Hit the gas… I mean, really hit the gas hard. This is an all-out effort, less than 40 or 50 seconds, so give it all you’ve got. You’ll want to stand all the way through to the back straight as you get up to top speed and sit before you come into Turn 3. Two laps around the track and you are done. Easy-peasy, right? Here is a link to a video showing proper standing start technique: https://www.youtube.com/watch?v=1Zyoj7bb4zQ. If you’ve never done one before, don’t worry too much about it, the most important thing for your 1st time is to give it all you’ve got – I guarantee you’ll be pleasantly surprised at how you do. Best of luck to everyone competing and see you on Sunday! We recently had an opening on the board of directors, which resulted in one open seat out of our nine director seats. Four of our existing directors were insistent that our new director be a National Champion. The other four were insistent that our new director be a positive, can-do, get 'er done type. Luckily we had an LGer who satisfied both camps! Please welcome 2018 Brompton National Champion Katie Rollins to the La Grange board of directors. We are now at our full roster of nine directors - here is the website link. For those of you interested in getting involved on the board, we welcome you to attend board meetings - all are open to LG members, and elections are coming up in the fall. Here are a few things you will learn. Do you know the answers to any to these items? 1. Why is cyclist lane control almost always both legal and safer than edge riding? 2. What are the five most common motorist-caused car-bike crashes and how to avoid them? (it's the same solution for all five!). 3. What is the most important means of communication between cyclists and motorists? (Clue: It's not hand signals for turning and slowing, although those are important, too). 4. What options are available for group cyclists dealing with red lights and STOP signs that balance Safety, Cooperation, Convenience and Legality? 5. When do bike lanes make sense to use, and when are they are best avoided? Special thanks to Gary Cziko, Jonathan Weiss, the LG Board, and Chuy Orozco from Councilman Mike Bonin’s office for making this event happen. I had heard that Marc Thomas had been teaching a Drills for Skills class for several years but I thought, “I know how to ride a bike.” Well, I was right. I do know how to ride a bike but the lessons Marc teaches are how to handle yourself a bike. And, I must admit that I learned a lot and I definitely gained confidence on how to better handle myself when someone bumps into me or if someone touches my wheel. I could go on but I think the photo of Marc grabbing my arm and leaning into me speaks volumes. My only option was to lean back into him as we both rolled forward. It was not only a great lesson in physics it was a great lesson in confidence. It is never too late to learn. The next time we are lucky enough to get Marc to give up a Saturday morning to dispense his wisdom, I highly recommend you take advantage of it. I guarantee you will learn some very valuable lessons. And thanks to Jan Datomi for setting everything up! CBR-BQ, presented by La Grange! June 10th. Volunteer signups below for La Grange members! What is it? It's CBR, it's BBQ, it's CBR-BQ! Smoked brisket, ribs, chicken, sides, and bike racing! It's the best CBR of the year because it's a party to celebrate the end of the CBR series and La Grange regularly leads the pack! If you haven't been to a CBR, this is the one to go to. This year, we're going bigger. LG has been given a great opportunity to volunteer to help Kris and Jeff put on this staple of Southern California bicycle racing. We're looking for 10 La Grange members to assist in set up, race operations, and tear down. That inflatable start/finish bridge, we get to set that up for the enjoyment of all the racers! We'll get the race results posted quickly so racers can brag to their social media. And we'll get to collect all the valuables racers misplace and leave behind after the race so that they can get them back in a timely manner. So many good things happen because of our volunteer squad! For those who volunteer, you'll get a FREE ENTRY to CBR! If you don't want to race, volunteer to assist and then fill your belly with BBQ and relax knowing your fellow La Grange members and the SoCal race scene benefited from your contributions to keep our sport great. Sign up early to get the spot you want! Vive La Grange. Such a great well organised race with a pretty unique road stage. Stage 1: 4th, 2nd in the field up the bump, we let the eventual winner go on the first climb, was straight onto his wheel but couldn't hold it! Stage 2 : 6th crested Mt. Hamilton around 1:10 with the front group 4 with the same guy up the road, had to settle for 6th after some major hydration related cramping. Stage 4 : leapfrogged into 3rd with a prime sprint, and a race of watching the guy in front of me to make sure I outsprinted him, ended up only 1 point off 2nd place! Such a great weekend, you guys should all come out to next year and support an awesome stage race, that has opportunities for TT guys, pure climbers and sprinters! I needed to get out of LA and take a break from work. So Katy and I headed up to Boston and then Vermont. I decided to try out the Killington Stage Race even though the needed break from work was due to no time for friends or bikes. BRING ON THE MAPLE SYRUP POWER! 74 miles, not harder than SBRR course, and I'm off the back after I got gapped out approaching the second KOM point. 20% time cut and I stubbornly solo for the next 44 miles to get within minutes of the time cut. "What do you need?" Katy asks at the finish? "A cheeseburger." A 60 mile meltdown. I've secured the Lanterne Rouge regardless of tomorrow's TT result. Approaching the final 5 mile climb to the finish I had already bonked. At the top, I just collapsed into the back of Katy's waiting car. Fat Pat is tired. We got a National Brompton Champion and a Lanterne Rouge in a one month period. La Grange is unique. So I posted a picture of the start of my vacation that made me happy and warm. Yes, I got last in EVERY stage this weekend. Even today’s TT when I thought I did better than terrible. Alas, I like bike racing. I like it more than bike riding. Doesn’t matter if I’m top of my game or earning the honorable Lanterne Rouge (didn’t quit). La Grange is a bike racing club and I’m happy to line up when given the many opprotunities in CA or across the nation. It’s a priveledge this Memorial Day to keep doing what I love. The results, when they come, are great, but the opportunity to have the freedom to race, even to last place, is a gift.